I keep a wide range of albums to suit different tastes and budgets. 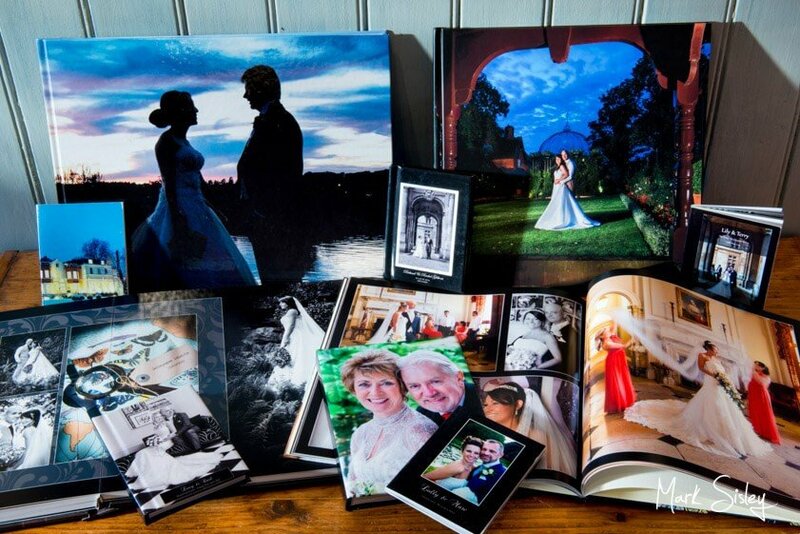 The principal wedding album can vary in price from £400 to £1,500, depending on size, style and finish. Probably the most popular right now is the glossy coffee table album; these are hand-made in Italy to exacting standards, and designed by my graphic designer, Jo. You have the chance to approve all artworks before we go to print. To view and handle the range of albums, you’re welcome to visit my studio before you place your order. Below you will see a brief description and pictures of each album style. The slim-line album has a hardback printed card cover and thin paper pages. You choose whether you prefer a modern or classic-style presentation; also select your chosen cover image and background colours, then leave the rest to us. This style is often chosen as the main wedding album. It is also popular as a parents’ or grandparents’ album, and the pocket-sized mini-photobooks make lovely thank-you presents for bridesmaids and ushers. These books can be made from the same artworks used for the glossy coffee table albums. They are available in mini, medium or larger sizes. Classic style presentation with photographic prints mounted behind overlays. The technique used to create these bespoke timeless albums produces a fabulous finish that will never date. 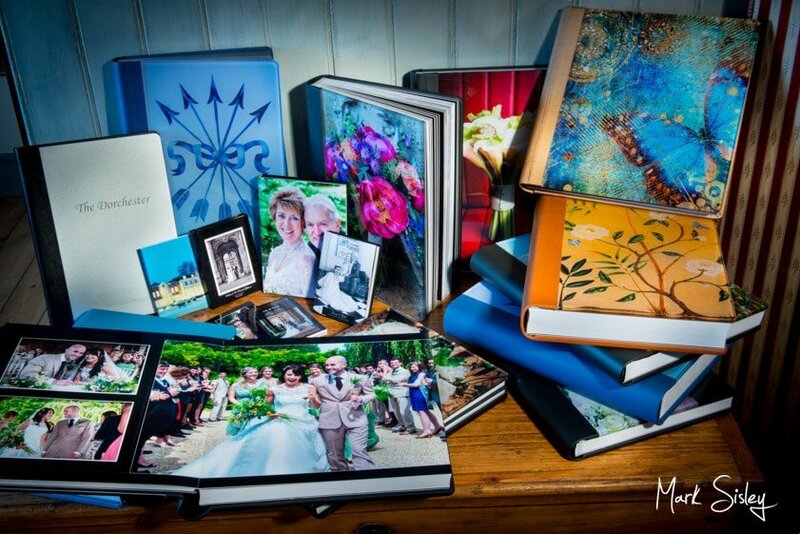 These albums are durable, and available in many different cover colours and materials. They are available in both post-bound and book-bound styles. We can put these together for you, or you can buy the album from us in kit form to assemble yourselves. The standard classic albums holds 6″x8″ prints throughout, or there is a larger version which holds a combination of 4″x5″ and 8″x10″ prints. This album choice does not appear on my price list; POA. These classic albums will hold up to 6 different size images throughout, including images to the very edge of the page, or across the entire double-page spread. This style of presentation is less flexible than the glossy coffee table option as we are restricted by the templates from the manufacturer, but still produces stunning, unique results. 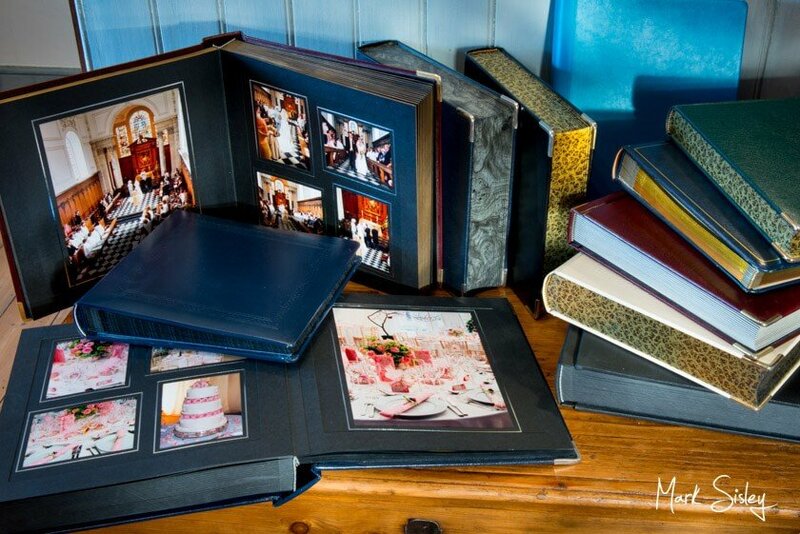 If you like a more traditional style presentation, this luxury album may be perfect for you. 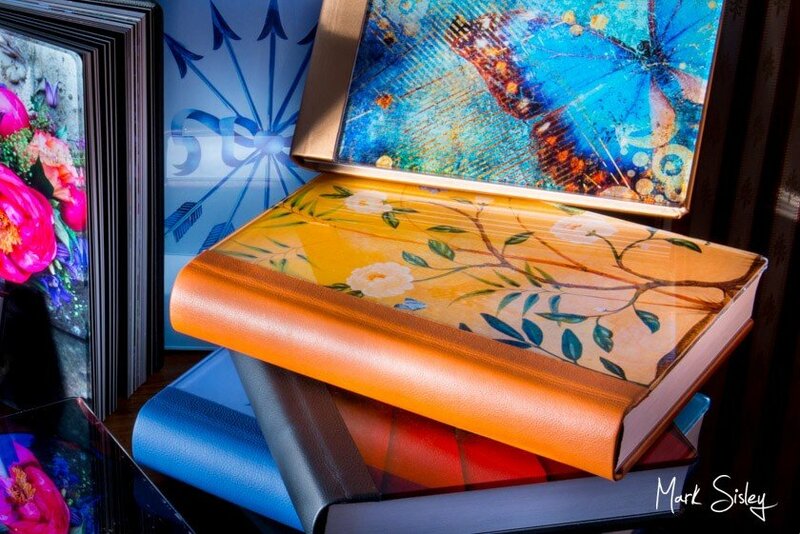 The most popular choice is the stunning Italian Graphistudio book-bound coffee table album. I believe Graphistudio albums are the world’s finest digital art albums. 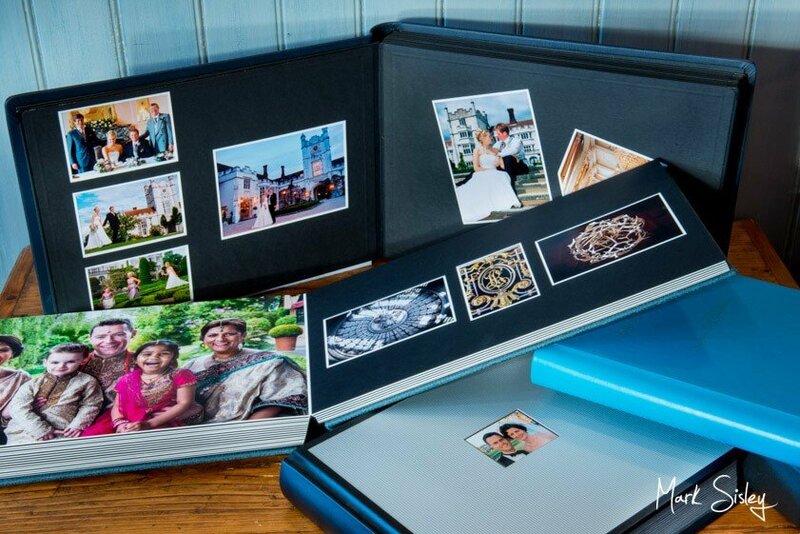 They produce stunningly luxurious bespoke albums, with images printed onto thick photographic, gloss, linen, smooth or metallic paper, which can be laminated for durability. Cover options include Perspex, leather, silk and metal. My graphic designer Jo creates the bespoke page designs, then you approve or request alterations to the design online before we produce the album. Graphistudio produce luxurious presentation boxes, cases and leather sleeves for their albums. These can be customised with your names embossed on the cover or on the spine, or with your favourite picture from the wedding on the outside of the box. The manufacturer offers a multitude of options for colour, style and materials. I keep examples of many of these at my Chesham studio, and you may also wish to visit the Graphistudio website to view their entire range of luxury products. The Brocket Hall album video contains a selection of my favourite photographs from the wedding of Lucie and Chris, they had the most beautiful blue skies for their special day. The bespoke album artworks and designs are created by us in house, the Italian album manufacturer is Graphistudio. The cover is made of nappa leather with lasered text, all the images are printed onto archive photographic paper. This album of The Dairy, Waddesdon contains my favourite selection of pictures from Hannah and Rob’s fabulous wedding. The image on the cover is behind perspex, the spine & album back is a grained leather, all the images are printed onto archive photographic paper. 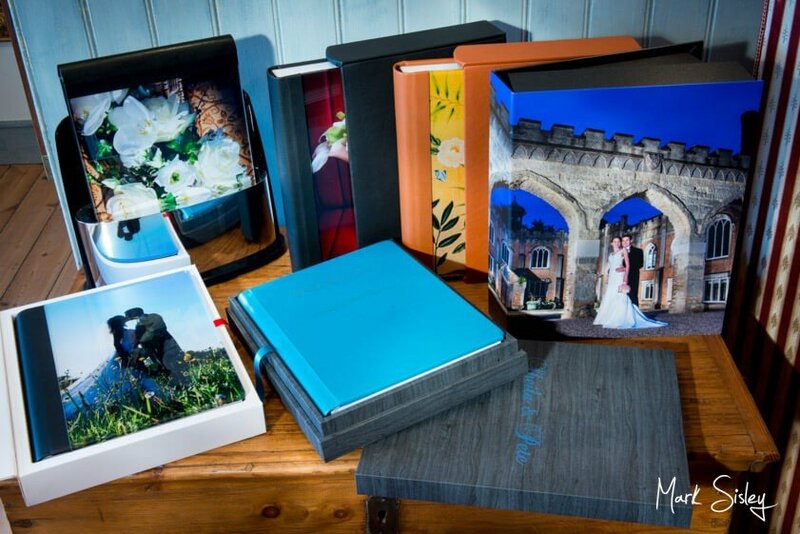 My Graphistudio Matted album video contains a selection of photographs from different venues in the Home Counties area. The bespoke album artworks and designs are created by us in house, the Italian album manufacturer is Graphistudio. This album uses debossing, varnished surfaces, and different finishes of photographic paper throughout to create the most unique finish. The artwork on the cover is behind perspex, the spine & album back is a smooth gold fabric, all the images are printed onto numerous types of photographic paper. My Taplow House album video contains a selection of my favourite photographs from this gorgeous hotel, the venue has been recommending me for over fifteen years. The picture on the cover is behind perspex, the spine & album back is a grained leather, all the images are printed onto glossy photographic paper. My Dorton House album video contains a selection of my favourite photographs from this fabulous venue. The bespoke album artworks and designs are created by my in house designer Jo, the Italian album manufacturer is Graphistudio. The picture on the cover is behind perspex, the spine & album back is a grained leather, all the images are printed onto photographic paper. This album of The Dairy, Waddesdon contains my favourite selection of photographs from Sheila and Pete’s amazing wedding. The Dairy has been recommending me for over fifteen years. The portrait on the cover is behind perspex, the spine & album back is a grained leather, all the images are printed onto archive photographic paper.